For the nation's 10 biggest banks, Hawaii is no paradise. The sunshine and gorgeous beaches of Hawaii may attract millions of tourists to its islands every year, but the nation's largest banks steer clear of the state. While the ten biggest banks in the country -- including Bank of America (BAC), Citi (C), Chase (JPM) and Wells Fargo (WFC) -- have plenty of ATMs and branches in most states, that's not the case in Hawaii. In fact, Hawaii is the only state in the country where none of these megabanks have a retail presence. A combination of factors have kept these large banks at bay, including Hawaii's distance from the mainland, its relatively small population, high real estate costs and stiff local competition, say banking analysts. "It's the kind of place you'd want to get to go on a business trip to ... but it's not an attractive market from the perspective of having to manage [a national bank]," said Brian Riley, senior research director at consulting firm TowerGroup. Thousands of miles away (and pricey): More than 2,000 miles from Los Angeles, Hawaii is the least accessible state for banks to do business in, said Riley. It has its own time zone and is five or six hours behind the East Coast, so national banks would need to hire additional employees to staff their national call centers during Hawaii's business hours if they don't already operate 24 hours a day. They would also need to transport equipment, like ATM machines, tacking on added costs. Even if a bank decided to bridge the time and distance gap, the potential payoff would likely be small. 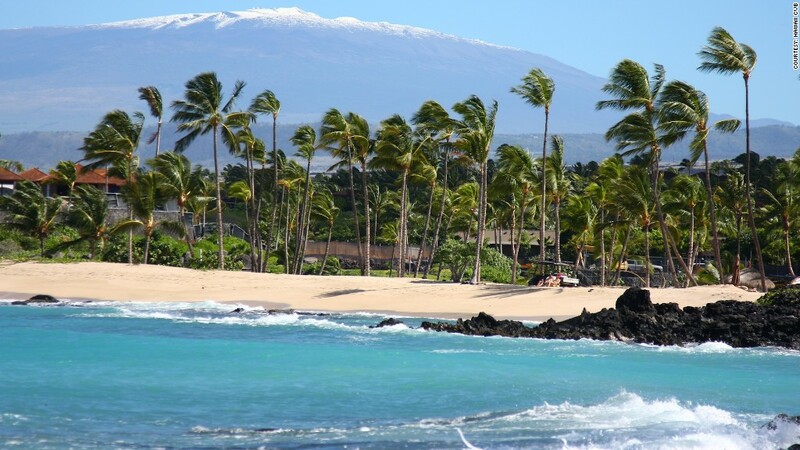 With a population of 1.4 million people, Hawaii is a miniscule market compared to a state like New York, which has more than 19 million people. Related: Who are the unbanked? "We are a very small market in the grand scheme of things and our remoteness probably also detracts from interest from the large banks on the mainland," said Edward Pei, executive director of the Hawaii Bankers Association. One big national bank, which asked to remain anonymous, agreed that it would simply be too expensive to operate in such a remote area. Real estate would also be no small expense. The median commercial property price in Hawaii is $448 per square foot -- more than triple the national median of $141, according to Real Capital Analytics. And land is so limited to begin with that storefront space in prime locations is especially hard to come by, said Pei. Local banks rule: Any bank that dares enter Hawaii will face stiff competition from the banks that have already staked their claim. First Hawaiian Bank, a subsidiary of BNP Paribas since 2001, and Bank of Hawaii have gained about 71% of the market share since opening their doors in the 1800s. And many customers have gained a sense of loyalty to these banks over the decades, said Pei. "Hawaii consumers do seem to have a higher degree of loyalty to their financial institution, which makes it more difficult for out-of-state banks to enter the market," Pei said. While Hawaii's biggest local banks would likely be tough competitors, smaller banks and credit unions would risk going out of business altogether. Consumers, however, would likely benefit from the added competition, said Eugene Tian, chief economist at the Hawaii State Department of Business, Economic Development & Tourism. "Competition is always good for consumers because they will have more choices -- which usually leads to lower prices," said Tian. In 1992, Bank of America became the first major national bank to make a foray into the state when it purchased Honolulu Federal Savings & Loan. While savings and loans often offer many of the same banking services as traditional banks, like savings and checking accounts, they are required to hold a certain percentage of their assets in mortgage loans and are limited in the business lending they can do. Bank of America intended to convert HonFed into a commercial bank, but the transition proved too challenging and it couldn't compete with Hawaii's other local banks, said Pei. So after a five-year tenure -- during which HonFed's assets declined substantially -- it sold its branches to another Hawaiian bank, he said. Bank of America said it does have one mortgage loan office in Hawaii. Now, more than a decade later, Bank of America says it is investing in banking centers "where there's a high-growth opportunity and where it makes the most sense and where we know our customers bank," according to spokeswoman Tara Burke. The local market and costs of operation are among the factors it considers. For states where Bank of America doesn't have a presence, Burke said there are mobile and online banking platforms that customers anywhere in the country can use. Other banks said their branches have always been limited to certain geographical regions that simply don't include Hawaii. PNC, for example, said its branches are concentrated in the eastern United States, while HSBC places branches in "internationally connected urban markets" like New York City, Los Angeles and San Francisco. Many banks have even been shedding branches as they cut costs and focus on boosting their online and mobile presence, so there would need to be a very compelling reason for a bank to open a new brick and mortar branch anywhere -- especially in a place where they haven't had a presence before, said David Albertazzi, a senior analyst at Aite Group. "In terms of retail branch expansion, it's not a time to experiment, and [Hawaii] is viewed as a niche market for larger banks," he said.